Since no stable state was created during the occupation, once the occupational armies withdraw from Afghanistan, civil war and chaos will continue. 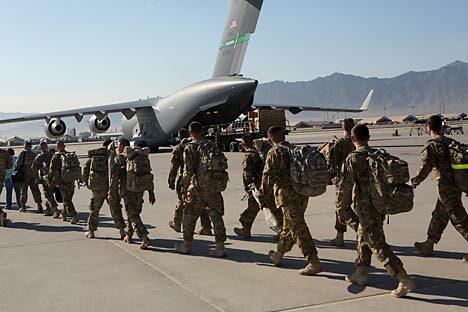 On January 1, 2015, Afghanistan, having said goodbye to the occupational armies of the USA and NATO, once again will become a sovereign state, though the goals of the Afghan War, which began in reply to the terrorism of 9/11, have not been met. No stable state was created in the years of occupation, and the civil war continues. In 12 years of occupation, there is neither an economy that can support the country nor a government capable of independently resisting the Taliban. In October, one of the leaders of the Taliban, Kari Nasrulla, declared that by 2015, the Talibs would restore the Islamic emirate in Afghanistan. “As soon as the Western armies leave Afghanistan, the old order of the country will be restored,” he promised. There is a sound basis for these threats. “The removal of international security forces is explained by the fact that by the end of next year, the Afghan security forces, and the Afghan army, will be able to take control of law and order in the country – although so far this has not been the trend. The closer the date of withdrawal of foreign troops approaches, the more evidence is coming out that Afghan security forces will not be ready,” declared Sergey Lavrov, Minister of Foreign Affairs of the Russian Federation, in an interview with a Russian television channel. Basically, the USA admits this as well. Otherwise, they would not be talking about agreements with Kabul on military and strategic cooperation. This means that the USA and NATO will keep nine bases in Afghanistan, where about 10,000 military personnel will be stationed. It seems that their duties will include continuation of the training of the army and security forces of Afghanistan, surgical strikes against terrorist bases in the region, and if necessary – support of the Kabul regime, believes Lieutenant Colonel Pyotr Goncharov, military expert on Afghanistan. It is obvious that the USA will continue to support the Kabul government. However, it is not fully clear who will take the helm in Afghanistan. On the one hand, secret and obvious contacts between the USA and Talibs did not achieve anything. The Talibs were not even invited to the Bonn and Tokyo international conferences on Afghanistan. Probably the idea of their involvement in the political process was given up as hopeless. On the other hand, on April 5, 2014, there will presidential elections held in the country, and the only thing that unites more than ten registered candidates – is opposition to the Talibs. Hamid Karzai, the president of Afghanistan is leaving his post, having reached the maximum term for holding power, according to the constitution. However, he wants nothing less than the helm of the country to be taken over by the people of his group – to be more exact, his older brother Qayum Karzai. His chances, given the administrative resources, are seemingly quite good, but the problem is that Karzai and his clan have gained neither glory nor respect among the Afghans, but rather earned a reputation of being puppets of the West. He is opposed by Abdullah Abdullah, former head of the Afghan Ministry of Foreign Affairs. He came in second during the elections of 2009. He has not tarnished his reputation by corruption scandals and counts on the support of the Tajik elite, close to powers of the “Northern Alliance”. Moreover, he has Mohammed Khan from Islamic Party of Afghanistan among his allies – one who is opposed to any foreign military presence in the country. Today there is another favorite, Abdul Rasul Sayyaf, an Afghan Islamist politician. However, in the USA, they consider that Sayyaf was the one who invited Osama bin Laden to Afghanistan in 1996. On the other hand, this candidate for president has one of the most influential politicians in western Afghanistan on his team, a well-known former field commander of Mujahedeen – Ismail Khan. The American military forces are promising a “winter campaign” against the Talibs, though previous operations were usually conducted only during the warm period of the year. By February, 30,000 American soldiers will leave Afghanistan, yet 20,000 will remain. It is obvious that under these circumstances, anti-government forces will try, if not to take control over the southern regions of the country, then at least to disrupt elections there. Even without that, the weak legitimacy of the Kabul authorities may be finally discredited. Whom will the American forces, which remain in the country, be helping then? Further scenarios were drawn up in the interdepartmental forecasts of the development of the situation in Afghanistan, which were prepared for the leadership of Russia by leading Russian foreign affairs experts, representatives of the Ministry of Foreign Affairs, the Ministry of Defence and other state structures. Experts consider the development of three scenarios as the most probable, after withdrawal of NATO troops – the Taliban coming to power, long civil war, and the division of the country into spheres of influence between the Taliban and the current regime. According to the majority of the participants in the situation analysis, “a sloppily executed division of the country into spheres of influence” is, in the short term, the most probable, “however, the Talibs will strengthen their positions, and if the situation deteriorates, a sharp destabilization and civil war are not excluded”. Fundamentally, this is a forecast of a country falling apart. The same occurred in Iraq – a weak central government, drifting away of the provinces, especially Iraqi Kurdistan, and guerrilla war of the Sunnis against the Shiite authorities.